Below you can view all the homes for sale in the Saddlewood subdivision located in Elizabeth Colorado. Listings in Saddlewood are updated daily from data we receive from the Denver multiple listing service. To learn more about any of these homes or to receive custom notifications when a new property is listed for sale in Saddlewood, give us a call at 720-580-6921. Convenient location 25 min to Parker or Castle Rock, 50 min to DTC or CO Springs. MLS#2046617. EXIT Realty Denver Tech Center. Could it be?..a soaker tub with a view, private deck and a massive walk in closet!But wait there's more...No no no for that you will need to schedule a showing! MLS#2670180. RE/MAX Structure. All Kitchen Appliances Included And Main Level Washer/Dryer, 2 Laundry Hook-ups ( 1 On Main Level & 1 In Basement) MLS#4005504. MB JD AND ASSOCIATES. 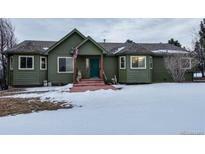 Convenient location 25 min to Parker or Castle Rock, 50 min to DTC or CO Springs. MLS#6418822. Courtney Stephenson. Additional water rights. You will fall in love. MLS#1500438. RE/MAX Alliance. Your new personal retreat awaits! Extremely energy efficient. MLS#1609209. BlueMatch.